Detroit Red Wings fans: put down your tar and feathers. On Thursday, the Red Wings announced that they’ve signed grinder Luke Glendening to a four-year contract extension with an average annual cap hit of $1.8 million. The former University of Michigan Wolverine has become a mainstay on the Red Wings’ fourth line over the past two years. With this announcement, fans have taken to social media to denounce the signing, citing various reasons. The cap hit, Glendening’s personal production, and having young, talented players in Grand Rapids/as healthy scratches were the main focal points of their arguments. However, the signing should be lauded. Yes, it is another long-term contract handed out to a loyal, hard-working player that fills a specific role with the Red Wings. And yes, Glendening does not produce the same kind of numbers that you’d expect from Anthony Mantha or Andreas Athanasiou. But, the energy player does fill a significant role as the Red Wings’ fourth line center and ranks among the top in the league for that position. Does he shut down opponents? Does he kill penalties well? Can he score when asked to? Can he win clutch defensive zone faceoffs? Here is how Glendening compares with other fourth line centers from top teams in the NHL. Note that the statistics used to compare the players are quantified by a “per game” or “per 60 minutes” factor to keep everyone on even ground. *Cap hits vary by season by player. Glendening’s new cap hit for the 2017-18 season is used. Matt Cullen’s cap hit was from the 2015-16 season (currently a free agent). All other cap hits are for the 2016-17 season. As you can see, Glendening ranks favorably in most categories. He has very strong blocked shots numbers and leads the sample group in shorthanded time on ice by nearly 30 seconds per game. The average shorthanded goals against could be improved, considering the Red Wings’ overall penalty kill strategy was a dumpster fire last season. Additionally, Glendening’s cap hit rank will change as well, given Jean-Gabriel Pageau and Chris Tierney will be restricted free agents following the 2016-17 season and will likely get raises. Considering the fact that Glendening ranks highly among top fourth line centers in the NHL and will have a below-market value salary when compared to the group, the deal he signed this week looks pretty solid for the Red Wings. If the Red Wings utilize Glendening strictly in this role—and not overuse him in unnecessary situations—they’ll have one of the best fourth line centers signed to a team-friendly contract. There will always be a debate about whether or not “role players” should have a spot in the lineup given their one-dimensional playing style. However, when you look at the last few Stanley Cup champions (Pittsburgh, Chicago, Los Angeles, Boston), they’ve all had grinding fourth lines that could play smart defensive hockey and keep opponents on their toes. This is what the Red Wings are paying Glendening $7.2 million over four seasons to do. 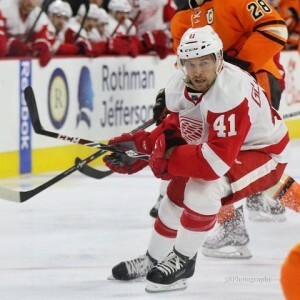 Did the Red Wings make the right move or a mistake with Glendening? Comment below to share your thoughts. Stats Glossary: G/GP: goals per game average; Hits/GP: hits per game average; BS/GP: blocked shots per game average; SH TOI/GP: average shorthanded time on ice per game; PPGA/60: power play goals scored against per 60 minutes of shorthanded time on ice; SH BS/60: average blocked shots per 60 minutes of shorthanded time on ice; DZ FO%: defensive zone faceoffs. Stats provided by NHL.com, ESPN.com, and Stats.HockeyAnalysis.com.